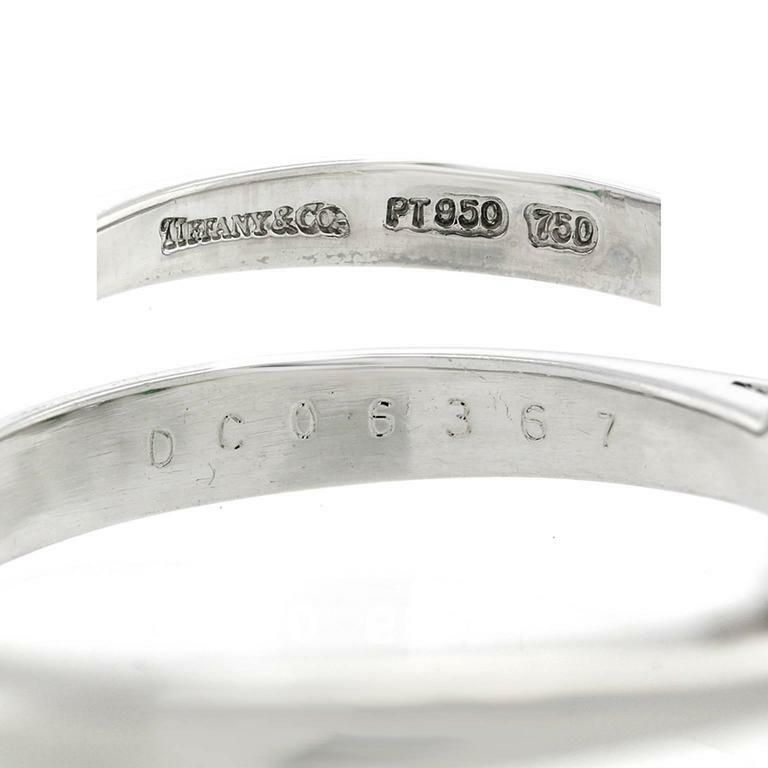 Circa 2000s, platinum/18k, Tiffany & Co., American. This three-stone ring from Tiffany is set with a .81 carat diamond and two .25 carat emeralds. 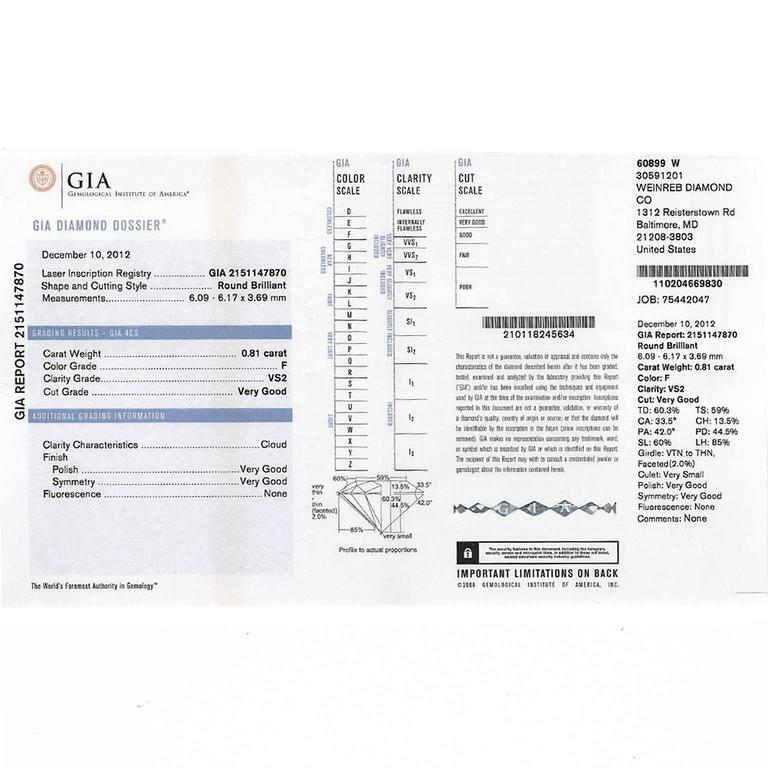 The diamond, a brilliant white stone (F color, VS2 clarity), is accompanied by a GIA report. 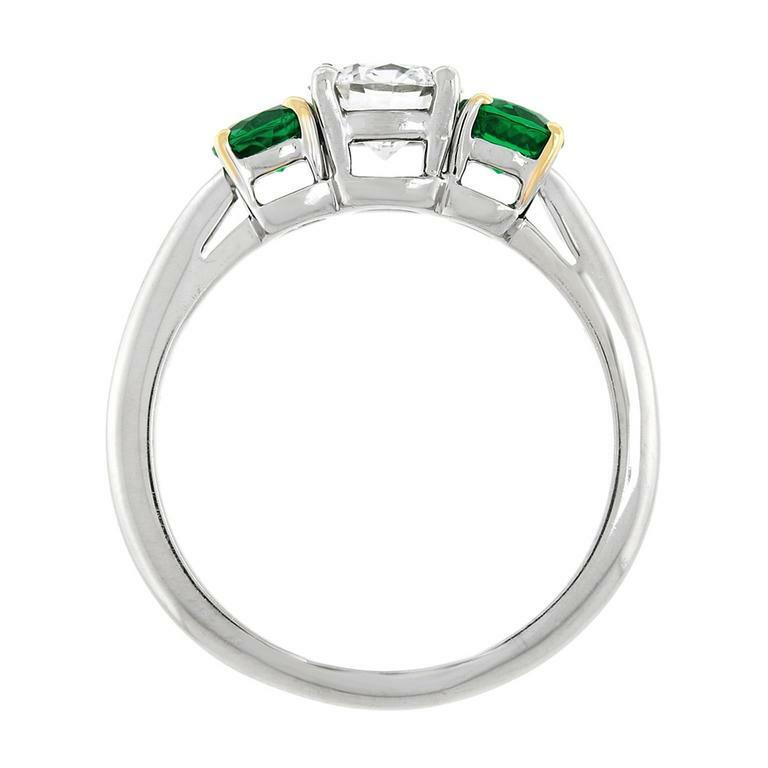 The emeralds have good clarity and are a gorgeous, vibrant, deep green. Finely fashioned, the look is smart and chic. Excellent condition. Remark: “Frederic Boucheron once commented that all great pieces start with superb stones. 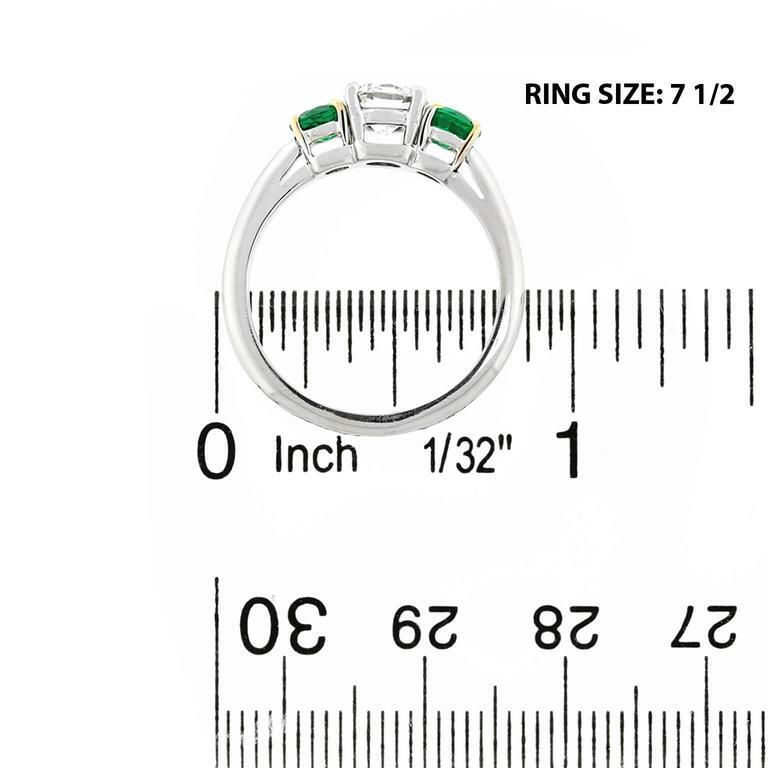 Tiffany excelled at combining this idea with classic tasteful designs, resulting in sublime everyday expressions of luxury.” SIZE: Ring size 7 ½ WEIGHT: 6.1 grams STONES: .81 carat diamond F color, VS2 clarity (GIA report) with .50 carat total weight of superb emeralds HALLMARKS: Tiffany & Co., PT950, 750, registration number CERTIFICATE: GIA report #2151147870 STOCK NUMBER: 15772 Jewelry acquired from this dealer must delight you. Purchases may be returned for any reason for a period of 7 days. Tiffany & Co. is one of the most prominent purveyors of luxury goods in the United States, and has long been an important arbiter of style in the design of diamond engagement rings. A young Franklin Delano Roosevelt proposed to his future wife, Eleanor, with a Tiffany ring in 1904. Vanderbilts, Whitneys, Astors and members of the Russian imperial family all wore Tiffany & Co. jewels. And Jacqueline Kennedy Onassis preferred Tiffany china for state dinners at the White House. Although synonymous with luxury today, the firm started out rather modestly. Charles Lewis Tiffany and John B. Young founded it in Connecticut as a “stationery and fancy goods emporium” in 1837, at a time when European imports still dominated the nascent American luxury market. In 1853, Charles Tiffany — who in 1845 had launched the company’s famed catalog, the Blue Book, and with it, the firm’s signature robin’s-egg blue, which he chose for the cover — shifted the focus to fine jewelry. In 1868, Tiffany & Co. gained international recognition when it became the first U.S. firm to win an award for excellence in silverware at the Exposition Universelle in Paris. From then on, it belonged to the pantheon of American luxury brands. At the start of the Gilded Age, in 1870, Tiffany & Co. opened its flagship store, described as a "palace of jewels" by the New York Times, at 15 Union Square West in Manhattan. Throughout this period, its designs for silver tableware, ceremonial silver, flatware and jewelry were highly sought-after indicators of status and taste. They also won the firm numerous accolades, including the grand prize for silverware at the Paris Exposition of 1878. Among the firm’s glittering creations from this time are masterworks of Art Nouveau jewelry, such as this delicate aquamarine necklace and this lavish plique-à-jour peridot and gold necklace, both circa 1900. When Charles Lewis Tiffany died, in 1902, his son Louis Comfort Tiffany became the firm’s design director. Under his leadership, the Tiffany silver studio was a de facto design school for apprentice silversmiths, who worked alongside head artisan Edward C. Moore. The firm produced distinctive objects inspired by Japanese art and design, North American plants and flowers, and Native American patterns and crafts, adding aesthetic diversity to Tiffany & Co.’s distinguished repertoire. Tiffany is also closely associated with diamonds, even lending its name to one particularly rare and exceptional yellow stone. The firm bought the Tiffany diamond in its raw state from the Kimberley mines of South Africa in 1878. Cut to create a 128.54-carat gem with an unprecedented 82 facets, it is one of the most spectacular examples of a yellow diamond in the world. In a broader sense, Tiffany & Co. helped put diamonds on the map in 1886 by introducing the American marketplace to the solitaire diamond design, which is still among the most popular engagement-ring styles. The trademark Tiffany® Setting raises the stone above the band on six prongs, allowing its facets to catch the light. A lovely recent example is this circa-2000 platinum engagement ring. Displaying a different design and aesthetic (but equally chic) is this exquisite diamond and ruby ring from the 1930s.